At least 12 people have been killed in the eastern Indian state of Chhattisgarh by two bombs planted by suspected Maoist rebels as voting continues in the general election. The first blast hit a bus carrying election officials in Bijapur district, police said, killing seven. The second attack – half an hour later – killed five police in an ambulance in the Bastar district. India began five weeks of general election polling last Monday. Officials said the bus in Bijapur district was blown up by a landmine as it travelled between Gudma and the town of Kutru. Four people were injured. Several people were also injured in the separate attack on the ambulance, which took place in the village of Kamanar, election officials said. Maoist rebels have staged frequent attacks over several decades across a swathe of India in their campaign for the poor to have a greater share of India’s natural resources. Chhattisgarh has seen some of the worst violence. Polling began in part of the state on April 10 and continues with two further rounds in the coming weeks. Elsewhere, voting resumed in the fourth stage of the general election on Saturday in four states – Goa, Assam, Tripura and Sikkim. Sikkim, a tiny Himalayan state, is also holding local elections, including the contest for a seat in the regional assembly which is reserved for a Buddhist monk. 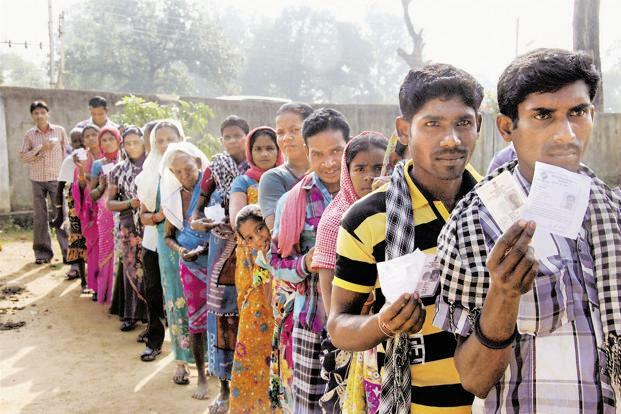 The first key day of polling saw millions of Indians vote on Thursday in 14 states. The governing Congress party, led by Rahul Gandhi, is pitted against the main opposition BJP, led by the Hindu nationalist, Narendra Modi. However, the anti-corruption Aam Aadmi (Common Man’s) Party, with its stronghold in the capital, Delhi, is mounting a strong challenge. More than 814 million Indians are eligible to vote in the polls, which opened on April 7.